Learn how to make this fast and easy fireworks picture that can be used as a wonderful 4th of July decoration. 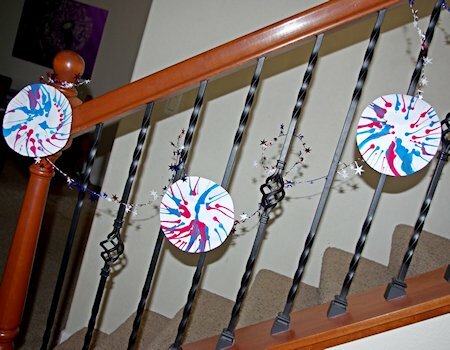 Heidi, from Happiness is Homemade, had her son use a salad spinner to make the red, white, and blue pictures and then paired them with some star-studded garland! Learn how to make your own Salad Spinner Fireworks. You could do the salad spinner project using old CDs. The would look lovely in the garden too.